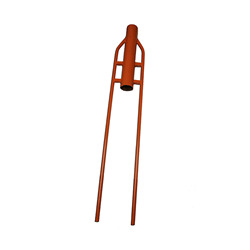 Make your installation easy with our Heavy Duty Sign Post Driver for up to 3 LBS/FT Sign Posts. Dimensions: Length 65-inch. Barrel 3-3/4-inch diameter and 24-inch long. 38 lbs. Also works for square and round sign posts. To use it, you slide it over your sign post, then you stand it (and your sign post) upright. Simply pick up the Sign Post Driver and drop it. Each time you drop, it will drive your sign post a little deeper into the ground.